I have more questions about Online CAT Course, what should I do? The explanations are lucid, the pace is easy to handle and all at the comfort of your computer. The doubt clearing sessions are a great additional feature and all at a really nominal price. our online course was of great help during my preparation for the CAT and other entrance exams. I am sure many students feel the same way, especially those like me who couldn’t attend regular coaching classes (due to a variety of reasons). Once again, Thank you Sir! I started CAT preparation 1.5 months before the exam and only joined your course. I got 86 %ile in CAT and the whole credit goes to you. You are a great teacher and many of your tricks actually do come in handy while giving exam  Last year I had scored only 43 %ile. We have put out the results (with marks and percentile) of all our students in the public domain. We have done this to bring a certain amount of transparency to our results. 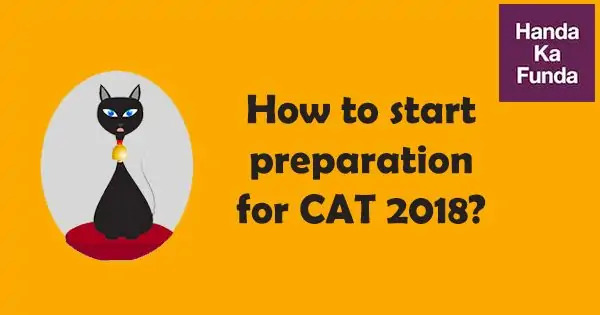 Wondering about how to start preparation for CAT 2018? Here we discuss the basic details and help you come up with a preparation strategy. In case you have ever wondered how many questions to you need to solve or how much do you need to score to get a particular percentile, we have tried to answer those questions with the help of data. We have used the data from thousands of students from CAT 2015, CAT 2016, CAT 2017 to come up with the answer. Study Plan-What to do from Today? Wondering about how to plan studies for the CAT preparation? What should be the study plan? Here we discuss the guidelines that can help to figure out the right way and study plan that will benefit the students. Reading comprehension part is something which needs good reading skills and good vocabulary because to jump directly into the passage solving will not serve the purpose. In case you have no idea how to prepare for the RC section, here we discuss basic details and the 6-month preparation strategy for reading comprehension. In case you have absolutely no idea where and how to prepare for the logical reasoning section or you might not even have started preparing for it. Here is a 6-month study plan on how to prepare logical reasoning for CAT. Also, we have discussed the topics which are asked/not asked from past few years. Data Interpretation involves a lot of practice and patience to solve. Data Interpretation topics are something which can’t be said as easy to solve or difficult to leave. It is all about speed and calculations. Here we discuss the 6 months preparation strategy and common topics to be studied thoroughly in order to score in Data interpretation section. Q1. Does the Online CAT Preparation Course cover entire syllabus for CAT? Ans: Yes.The 750+ video tutorials in the Online CAT preparation course cover the entire syllabus. They cover videos on basic and advanced concepts of Quantitative Aptitude, Verbal Ability, Logical Reasoning, Reading Comprehension, and Data Interpretation. There are plenty of solved example videos and also all previous year CAT questions are also solved on video. You can download the detailed list of videos here. Q2. How will I clarify my doubts in Online CAT Preparation Course? Ans: Via Live Classes. Students send in their doubts via the Online forum called course-feed or sometimes via email. Ravi Sir clarifies these doubts via the online live classes on the weekend. With respect to strategy and exam preparation tips, you can just call and talk to Ravi Sir. Q3. How do I make the payment for Online CAT Preparation Course? Ans: Register Now is the button you need to click. Once you do, a popup would open. You will be asked to first enter your personal details and then your billing details. After that, you will be directed to a secure payment Gateway where you can make the payment. It is 100% safe and secure. Q4. Where can I watch some demo videos of Online CAT Preparation Course? Q5. What if I don’t like the Online CAT Coaching Course? Ans: We would strongly recommend that you go through the demo videos (click here to view demo) and check for two things: a) Are you able to play all the videos on the device that you plan to use b) Do you like the way the content is taught. As far as the content is concerned, it is available as an excel sheet in the answer to the first question. However, if you have any problems with any of our products or courses – please feel free to reach out to us on [email protected] and we will help you with it. We will not be able to process any refunds. Have more questions about our Online CAT preparation Course? Ravi Handa has an experience of nearly a decade in CAT Coaching. An alumnus of IIT Kharagpur, he started teaching for CAT in 2006. Since then he has helped thousands of students to prepare for CAT. He has worked at leading CAT Coaching institutes like IMS and TIME. He was the pioneer in the field of Online CAT coaching when he started his Online CAT Preparation Course in 2012. Since then, 20000+ students have enrolled and benefited by his online courses. He is always available on various social networks like Facebook, Twitter, Quora, Whatsapp – we do not know how he manages that. The Online CAT Preparation Course contains a set of 750+ video tutorials covering all the basic and advance concepts of Quantitative Aptitude, Data Interpretation, Logical Reasoning, Verbal Ability, and Reading Comprehension. They also contain previous year CAT questions with various shortcuts, tips, and tricks. Along with that, there is a special set of videos based on Vedic Maths to help students calculate quickly. Live classes will be held initially once in two weeks and slowly their frequency will be increased to twice in one week. In case you miss any of these classes – not a problem. They get recorded and are available for future viewing as well. The pattern of the CAT Exam keeps on changing. Our CAT 2018 test series will be based on the latest pattern. In case there are any changes in the pattern in CAT 2018 Exam, we will incorporate those in our test series. The CAT 2018 Test Series consists of 10 full length tests. The CAT Online Preparation Course consists of a lot of PDFs and documents that help you prepare for CAT. You will get previous year CAT Questions which are sorted in a topic-wise fashion. We often get asked – why is your Online CAT Coaching Course priced so low? The reason is simple – we want to reach out to a large number of students. We are extremely proud of the fact that we can provide the best CAT Coaching at such low prices.